I can't believe it's already (almost) Fall again! According to the calendar at least. It's still humid and so, so steamy where I live! Now, I've never been a huge pumpkin fan, but I still love my fall-y drinks. When the early months of fall roll around I pull out my mug and start filling it up with peppermint hot cocoa (it's never too early for hot cocoa), warm chai tea, and peanut butter lattes. 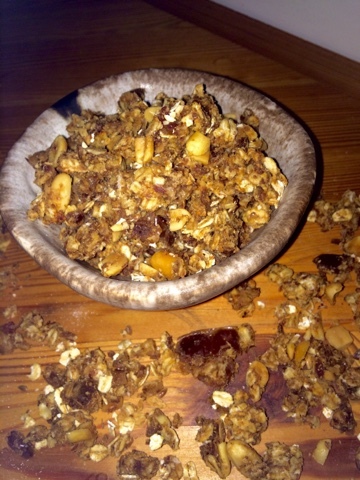 I decided to celebrate the season nearing with a batch of homemade granola. 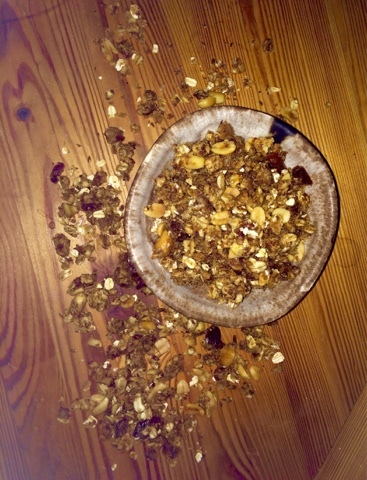 Not just any granola though. 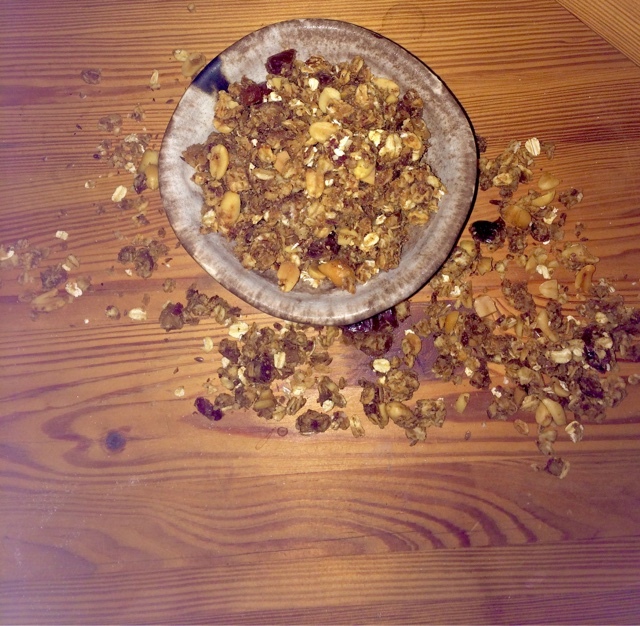 This granola is everything fall in my opinion. Sticky, caramel and peanut butter clusters with a hint of cinnamon, vanilla, and a finishing dash of sea salt. Did I mention it's also vegan, refined sugar, and oil free? When I was younger, I hated peanut butter. I know! Who could hate peanut butter? I guess I just didn't like how thick my dad would spread it on when he made my PB&H's (peanut butter & honey). It overpowered the honey. On top of that, I've always been more of a sweet over savory person, and peanut butter just wasn't fixing this girl's sweet tooth. Well that all changed a couple of years ago when one of my friends told me about melting peanut butter first. Seriously, if you haven't tried melted peanut butter, you're really missing out. Now I spread my favorite condiment on everything; oats, smoothies/smoothie bowls, sweet potatoes, fruit, crackers, and of course, I've brought back the PB&H's. At first, chocolate and peanut butter was obsession. The funny thing is I've never liked Reece's cups. I prefer my peanut butter all gooey and melted, not all hard and crumbly. Don't get me wrong, I'm still ardent for the combination, but I've found a new combo that is absolutely ridiculous. Caramel & Peanut Butter. I promise you, it's a addicting. Almost as addicting as my Nana's rolls. And trust me when I say that no matter how many of those fresh-out-of-the-oven, soft, buttery rolls you pop into your mouth, you can always do just one more because they are that dang good. 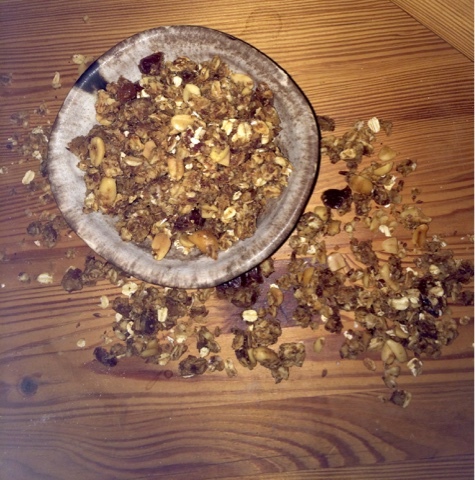 Back to the granola. I had to play around with the recipe because of how wet it started out from all the peanut butter and "caramel", but I finally got it just right. Beware... it's sticky. But it's worth it. Roughly chop the dates. Bring to a boil with a 1/4 cup of water, and reduce to a simmer, adding more water as needed. Simmer for about 10 minutes and whisk the peanut butter, cinnamon, and 1/2 tsp. salt in. Add water if needed, the consistency should be of a thick caramel sauce (dates should still be chunky). Set aside. 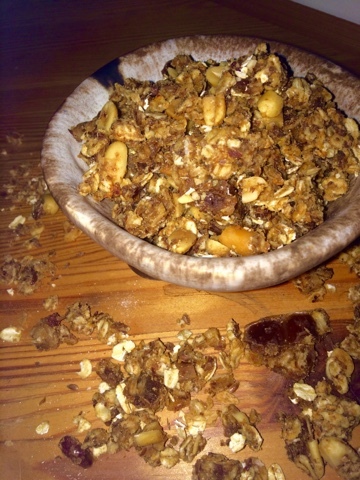 In a bowl, mix the oats, flax meal, flax seed, and peanuts. Pour in the peanut butter and date sauce. Crumble around with your hands and spread evenly onto a baking sheet. Bake for 10 minutes and let cool completely. Bring 1/4 cup water, and coconut sugar to a low boil. Add 1 tsp. salt, and peanut butter powder in. Let it grow to rapid boil for 20 seconds. Turn down to a simmer and whisk until thick and creamy (about 1 minute). Set aside. Once cooled, bake again for 15-20 minutes (until crispy but not brown). Take out and immediately pour the caramel sauce over it. Toss together, and again, lay out on the baking sheet. Bake for another 5 minutes. Let cool completely and crisp up. Taste & sprinkle with sea salt if wanted more. Now grab a big bowl, get ready for the colder months, & eat up!